I do not know how long it’s been since I’ve done a Doomino Effect. All I know is that it has been too long. So it’s time I returned (sort of like the last time I returned, when it had also been too long since I’d done a Doomino Effect … I’ll try to actually be back next week). 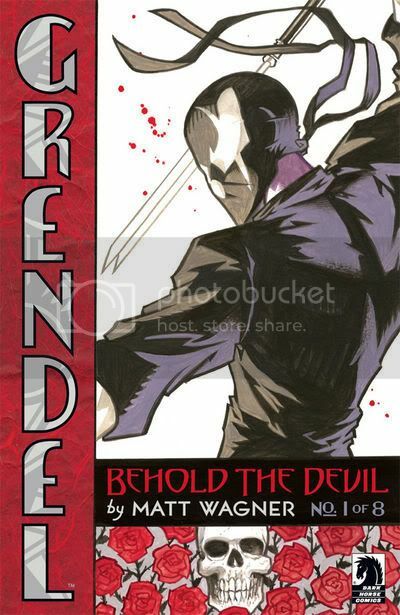 Speaking of returning, that leads me to Grendel: Behold the Devil #1 of 8. The teaser issue #0 was one of our (Satan’s) Books of Double (Evil) Doom back in July, but that was eight pages of preview that wasn’t necessarily eight pages of story. This is proper Grendel with heads rolling as mobsters are decapitated and reporters are fellated; Hunter rose and cops feel; the protagonists queried as Grendel parried. Okay I’m done with those. But I like the idea of Grendel’s supreme confidence being chipped away a bit. My familiarity with the character is superficial enough to not know if this has been done before, but it’s new to me, and it’s a direction I’m happy to see explored. 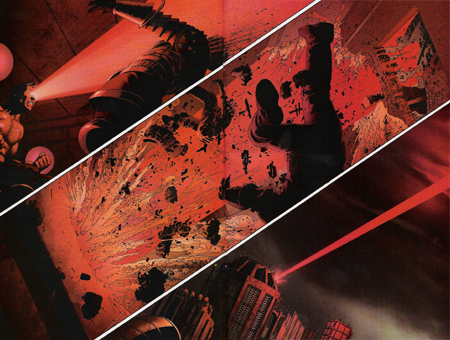 Matt Wagner’s art continues to impress me, for better or for worse. While I highly doubt he could get a comic illustration job at a publisher with any kind of distribution, his style still works for Grendel. Maybe it’s just because of the personal connection — he knows exactly what to do and where. But the occasional clumsy line and misshapen anatomy don’t pull me out of the story very often, at least not on first read. Wagner is one of those creators whom I admittedly have a bias for. He’s earned enough goodwill with me from the Grendel stuff I have read, Trinity, the Batman minis and Sandman Mystery Theatre that his work would probably have to be bad for me to be disappointed with it, but Michael Allred and Eric Powell have shown me lately that even the biggest heroes can fall. And speaking of heroes falling, that leads me to Captain America #32. Agent 13 is still compromised and fighting; Bucky was close to slipping back to the dark side but the little bugger stuck it out until getting dropped from the sky; Sam’s flying around and Natasha is still super hot. The best part of this issue was that there’s a super secret lair in the tunnels beneath New York City. I don’t care how many times that well gets tapped, I love it. Mimic, Ghostbusters 2, Captain America — I love it all. This series is leading up to the crowning (or shielding?) of the new Captain America. You read it here first — Sharon is pregnant with Steve’s super-sperm, which will gestate rapidly and reach full maturity in time for issue #34 when Ed Brubaker and Alex “I’ll Make Your Costume Shiny!” Ross reveal the result of Super Soldier Serum swimming for the prize. Remember I called it. Either that or it might be Bucky. Whatever, this series rules. …[W]e’re relaunching Criminal in Feb. with a new 1 and changing the format a bit. We’re expanding both the lead story and the back pages section, so we’ll now be a 40 page book. I considered not renumbering because of it, but I figured, no one reading the book now would stop because of the renumbering, but we’d probably attract a lot of new readers and retailers and get a chance to do a big PR push. Sounds like a good idea to me, I guess. They’ve gone through ten issues so far, so why not start up a new volume to get the interest of people who haven’t gotten onboard yet? And, seriously, for those of you who haven’t, what the hell is wrong with you? If you know me, I’ll lend you the first ten issues to get you up to speed. What I like most about this series is the scope, I suppose. 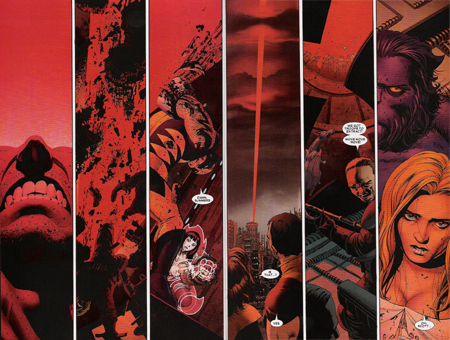 Brubaker’s created a whole bunch of characters, an entire world, really, that he can play around with. 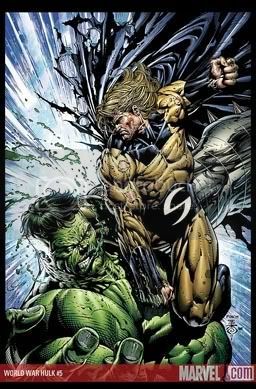 After the first five issues, which focused on Leo as the main character, the narrative switched to third person for the next five issues, focusing on ex-Marine Tracy Lawless, who was briefly mentioned in the first set of issues. Next up, it looks like the focus will be on the former boxer/owner of the Undertow, the local bar that all of these criminals frequent. 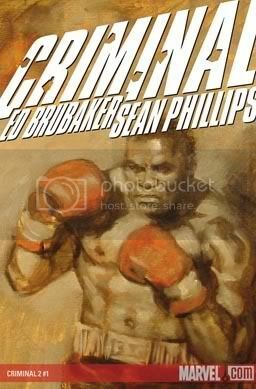 If you’re not reading Criminal, get caught up, and start reading with the rest of us in February. You won’t be disappointed. I really expected Gail Simone to hit one out of the ballpark with her first issue of Wonder Woman. Well, she didn’t, but that doesn’t mean she didn’t deliver an entertaining issue. 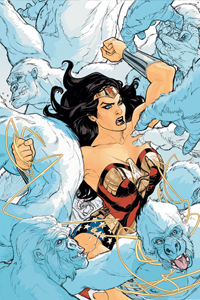 Wonder Woman versus an albino gorilla army was a nice way to start of the issue. It was a good action scene, and I really liked the line about WW preferring “never to use Batman’s methods.” Establishing early on that WW has her own way of doing things was important. There’s a lot of people with powers very similar to Wonder Woman, so it’s good to know that WW isn’t interchangeable with all the other super-strong, nigh-invulnerable flying heroes out there. I also like that Simone teased a story featuring Hippolyta and a quartet of mysterious prisoners, and one of those prisoners’ desire to kill WW. It’s nice to know that Simone’s run is headed somewhere, instead of just being a series of adventures with no connection between them. With the end of the story being a bunch of uber-Nazis storming Paradise Island, I’m a little worried Simone may blow her wad a little early with this story, though. This seems like the type of thing that could build for quite a while as a sub-plot before actually coming into center stage on the title. Being unfamiliar with Wonder Woman’s history from One Year Later to now, I was really lost about anything that happened at Diana’s day job. I know the characters of Nemesis and Sarge Steel from the few issues I’ve read before now, but I don’t really know their personalities or motivations. Hopefully along the way Simone will flesh out these guys a little more for those of us who don’t know their history and really don’t want to go back and read 13 crappy issues to learn it. Wow, that was a close call. For the past couple of weeks, Countdown has shown promise. Here I was, thinking we had ourselves a genuine turn-around. Boy, was I ever wrong! This week, we’re back to the usual flawed piece of garbage we’ve grown to love to hate, and we’re (kind of) introduced to an all-new character (mostly) within the pages of Countdown. Can you guess who it is? He’s on the cover! Here’s a hint: He’s currently involved in the completely inconsequential Sinestro Corps War, but Countdown completely ignores that, gives him a costume change, ages him about ten-fifteen years, and changes just about everything about his character. Any guesses? Why, it’s none other than Superboy…er, SuperMAN-Prime! He’s wearing the same stupid suit that Superman, the real Superman, was wearing when he returned from the dead back in 1993, even though this promo image of the cover shows him in the traditional red and blue. Seriously, would it have been that big of a spoiler to make him wear black? I guess maybe at the end of the Sinestro Corps War, he gets a wardrobe change, so if that had come out before this, we’d know what we were in for. Who knows? GAAAH! BRRZT! BRRZT! ZZRRRTZ BZZT! AAAAAAAUUGH! CHUKK! Seriously, the last time anything remotely interesting happened in the pages of a Wonder Woman comic was over two years ago when she snapped Max Lord’s neck. 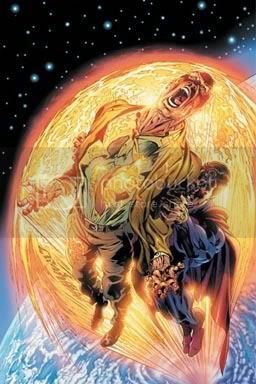 Nothing of note happened during the final pre-Infinite Crisis issues. The big One Year Later launch fell flatter than anything this side of Trials of Shazam, thanks in no small part to the shameful shipping schedule the books kept (or didn’t keep, rather). I’d like to say the Allan Heinberg issues sucked, but that would have required me to care enough about the story to actually read them. I will, however, say that the Jodi Picoult issues sucked. I guess Picoult had the abysmal Amazons Attack to contend with, but Peter David has shown me time and again that you can still tell good stories even if editorial forces you into a crossover. So why would I pick Wonder Woman #14 as this week’s Book of Doom? Gail Simone, writer of the best Infinite Crisis mini-series (Villains United) and the most underrated OYL series (Birds of Prey). If anyone can make Wonder Woman enjoyable, it’d be her. Come back on Saturday and see whether or not it’s possible. An electrifying new era begins for the world’s greatest superheroine! Gail Simone (BIRDS OF PREY, SECRET SIX) joins the phenomenal art team of Terry and Rachel Dodson for what promises to be one of the most exciting Wonder Woman stories ever told! What exactly is The Circle, and what deadly secret do they hold about Diana’s birth? What familiar face from Wonder Woman’s past returns with a mission to spy on Special Agent Diana Prince? 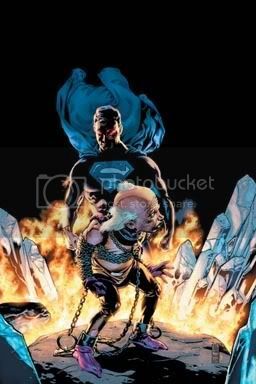 Why is the Department of Metahuman Affairs on a collision course with the wounded remnants of the Society of Super-Villains? You won’t want to miss any of this story that spans the globe and shakes Diana to her core! I was cleaning out my office this morning and noticed that I hadn’t looked through the November issue of Previews yet. While scanning through Marvel Previews and saw the cover to Fantastic Four #553. Michael Turner bashing has almost gotten to the point where it’s too easy. The guy doesn’t even seem to be trying anymore, and maybe because he’s in kind of a George W Bush situation – the people who still like his work are going to like him no matter what, and he’s alienated everyone else. He can’t draw ankles, wrists, females, males, varying faces, objects in perspective, anatomy… – okay, we get it. I’m as guilty as anyone for piling on, so I’m going to offer up something positive – a constructive suggestion for the Perfect Fit for Michael Turner. As if it’s not obvious already, that perfect fit is Fantastic Four. Virtually everything in his vast list of artistic weaknesses is rendered irrelevant by the super family! Mr Fantastic should have unrealistic anatomy; his ability to deform at will makes him impervious to the visual limitations imposed by perspective! His wrists and ankles can look however Turner wants them to! The Thing is in a similar boat – he’s not supposed to look like a guy. As long as Turner can draw a rock with three fingers and a thumb – which he can – they’re set! His ankles and wrists are like tree trunks – no sense of “body parts attached at joints” is necessary! He doesn’t even need a neck! And the fact that he has rocky lines all over his face hides the fact that his underlying facial structure looks like every other male that Turner draws. Beautifully convenient! Johnny Storm and the Invisible Woman are similar cases – with swirling flames and powers of invisibility, respectively, Turner can simply obscure or erase whatever he doesn’t want to draw! 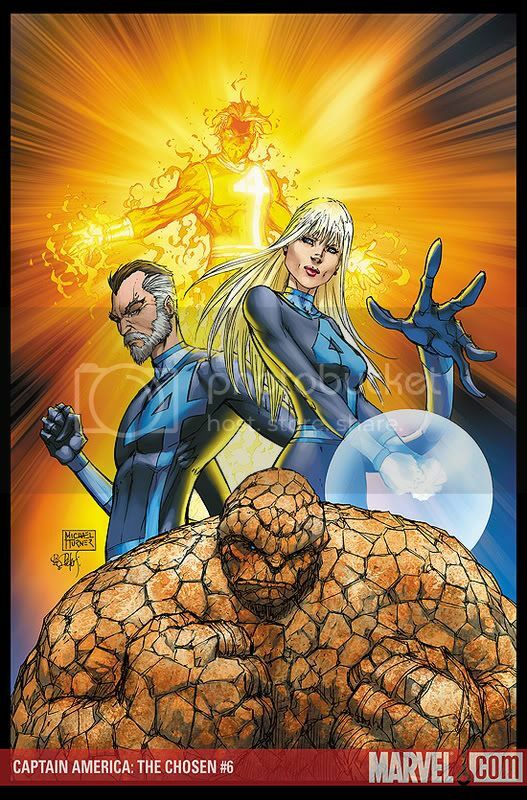 It’s a match made in Heaven, and it’s a match I was only able to conceive thanks to that Fantastic Four #553 cover. Now go do what you’ve got to do, Marvel – you’re so close already. Newsarama has learned that long-time Marvel penciler Mark Bagley, whose current exclusive contract with the publisher reportedly expires at the end of this year, will move to DC Comics to take on an undisclosed high-profile project likely sometime in 2008. Pretty big news. Fin Fang Doom should have some words. If memory serves, Bagley is Fin’s favorite artist of all time (or at least one of them). So, what say you, folks? With guys like Phil Jimenez jumping ship from DC to Marvel, this seems like a nice twist. DC’s had a shortage of good artists lately. ‘Bout time there was a shake-up. 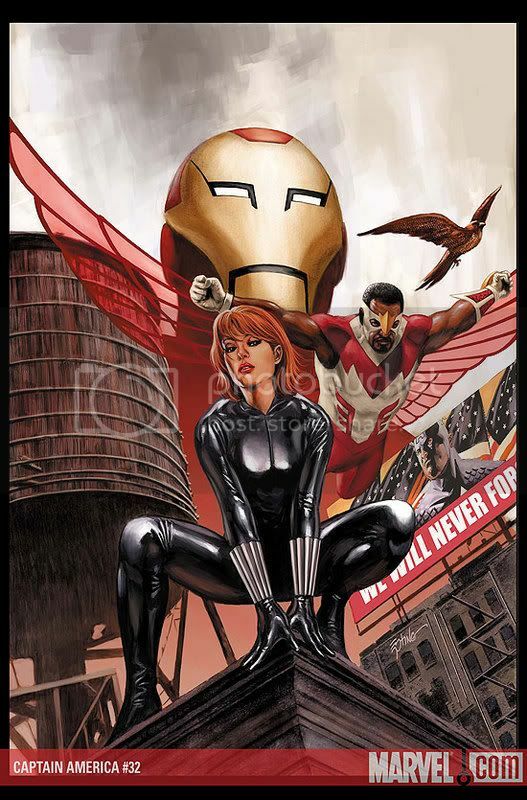 Hey, at least Bagley won’t be stuck on Mighty Avengers, eh?